The performance the world�s top truck makers demand. 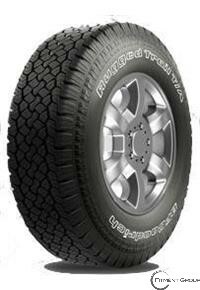 What it is: The all-terrain tire with all the attributes leading pickup and SUV makers look for when they select an original equipment tire: great traction, rugged looks, long treadlife, and a smooth, comfortable ride. Original equipment on many leading trucks. Who it�s for: Pickup, jeep and SUV owners looking for an excellent replacement for their original equipment all-terrain tires. Original equipment for today's best selling trucks - The performance the world's top truck makers demand, on-road and off. Reversible sidewall design - Raised outline white letters or reversible black letters look great on all SUVs, pickups and other popular light trucks. Two-ply polyester carcass and single strand beads (single wire wrapped continuously). ETEC SystemTM (Equal TEnsion Containment System)..